Apocalypse Now is finally available on hi-def Blu-ray Disc. 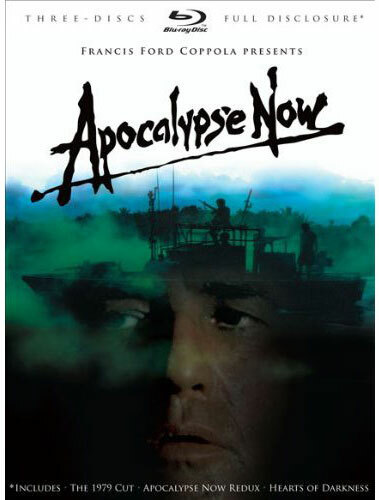 The three-disc set features the original 1979 cut of Apocalypse Now, Apocalypse Now Redux (2001), and the making-of documentary Hearts of Darkness (1991). Francis Ford Coppola oversaw the film transfers to 1080p AVC coded video with audio offered in DTS-HD Master Audio 5.1. The films will be presented in their original 2.35:1 widescreen aspect ratio — a first for the films as home media releases. Exclusive features on the Blu-ray Disc set include a 48-page printed collectible booklet with never-before-seen photos, storyboard gallery, audio commentary with Francis Ford Coppola and Coppola conversations with Martin Sheen and writer John Milius. Apocalypse Now (Three-Disc Full Disclosure Edition) retails for $59.99 and is currently on sale for $41.99.